Supernatural meets Buffy! Puppies and poodles and phantoms, oh my! When Ashlee's mate Will pushes for lupine breeding just as her twin Amber is exploring new magical powers, the impending Blood Moon threatens to turn a difficult situation into a total fiasco. Add in a witches' brew of mysterious out-of-towners, old and new enemies and creatures familiar and strange, and once again her life is turned upside-down. Can Will and Ashlee forge happiness out of their newfound bond, or will fate contrive to drive them apart once more? 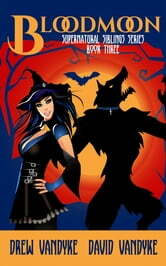 BloodMoon is an urban fantasy of werewolves, witches, ghosts and vampires, family, pack and kin. Love the characters and twists and turns. Will there be another one? ?